With the aim of creating an urban garden in Bomontiada, -trak made a landscape design suitable for urban planting and a system design for the maintenance. The landscape design was made by attaching cases with 60 cm soil in them to the second and third phases of the supporting walls designed for Bomontiada project. 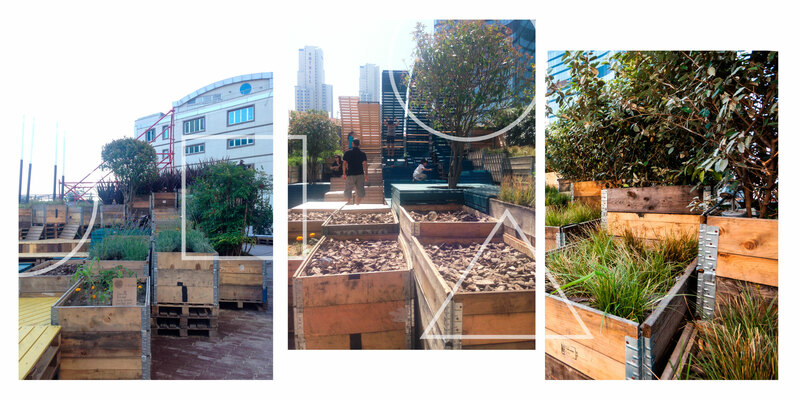 For the project whose service design for the maintenance was also made by –trak, we collaborated with Buğday (Wheat) Association to introduce the garden for users and to educate them on home/urban gardening. In three months, Buğday Association organized twelve urban gardening workshops scheduled for every other Sunday. At the end of these classes, participants planted seeds in the designed area. Since the participants came from different parts of the city, they couldn’t take care of the area after planting. The planned steps such as placing the plant cases in the neighborhood and encouraging the dwellers and the students for the maintenance of them have not been materialized. For the time being, Bomontiada staff takes care of the urban garden.